I’ve had over a month now to collect my thoughts on the Mega Man Legacy Collection for 3DS, but here they are still strewn about all over the place. You can observe my futile attempts at painstakingly assembling them below. First and foremost, by far most of what I’ve been reading online about this game center upon the issues with the Mega Man 5 emulation. I heard a lot about screen tearing and judder, but I’m honestly not sure what those terms refer to exactly. Some of the more detailed backgrounds do sometimes look blurry or messy when you go from standing still to moving to standing still again, but that seemed to be the case with every title 1-6 for me, so the only thing I could really figure is that this becomes more obvious in MM5 since its backgrounds are more detailed in general. Now there are some random graphical errors or glitches present that were certainly not in the Steam version of Legacy Collection, but small oddities like these are present in all 6 games as well, not just MM5. I also did not experience what I felt was any significant amount more lag in MM5 than the other titles. 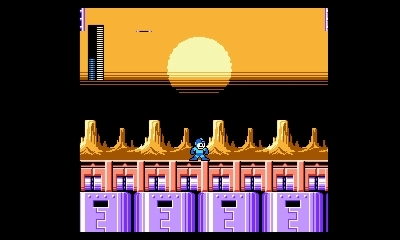 An example of a graphical glitch in Mega Man 5, extra lines appear below these low-swinging platforms in StarMan’s stage. I did however experience the unique crackling sound issues while playing Mega Man 5, particularly at the stage select, password and fortress map screens. Some have suggested the errors might be situational depending on whether you are playing the downloaded version or the physical release, though my understanding is that unless there was some copying error during the download, both the physical and digital ROMs should be identical. 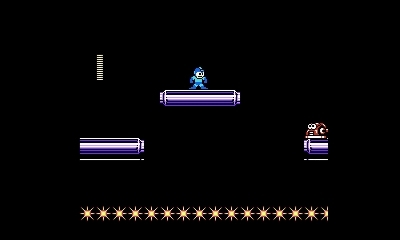 What I did notice was that when I was playing on my older 3DS XL, I did not encounter the sound issues with Mega Man 5. When I was playing on a standard-sized New 3DS (which was the only option I had available to enjoy the unlockable the Amiibo content), that’s when the sound issues stood out for me. So perhaps the issue has more to do with what version of the 3DS you are playing on than what version of the game you are playing. I should also mention that I typically only played with the 3D effect off because it does practically nothing during standard gameplay (more on that below), so it could well be that activating the 3D slider exacerbates things. I also did not experience the same sound issues when playing the Rockman 5 version. Going on a tangent here, I want to mention that the ability to swap between the “Mega Man” and “Rockman” version of each game is an excellent little feature that no other Mega Man collection thus far has ever included, and I for one really appreciate it. The different versions each utilize their own save state slots, which I’ve found to be useful in exploring the small differences between them. This feature has since been added in an update to the PC and console versions as well, which I think is a really nice touch also (even though there are several other issues from the PC version in particular I was hoping would be patched that were overlooked in the update, but I’ve already covered many of these). If you walk to the right in this area of TomahawkMan’s stage, the bottom pixels of this ladder will start to follow you. 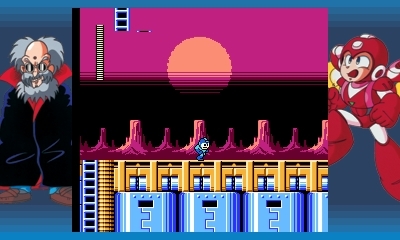 Back to the subject of sound, despite the Rockman ROMs being added into the mix, the Music player option has not been changed to include the Rockman 6 version of the opening cinematic song. I’m curious as to whether this is also true in the Rockman Classics Collection, in which case I wonder what the Japanese think of the fact that the music player doesn’t include the song version they would remember. I haven’t seen anyone reacting about it, though I have come across a few chuckles that “Mr. X” is listed as “Dr. X” in the Japanese version of the sound menu. Good for him going back and finishing his degree, especially at his age. At any rate, aside from changing how the menus look for 3DS, the content in the Music section is exactly the same, so expect no inclusion of the missing MM6 ending tracks either. Alternate stage version. If you inch along just right, you can separate the ladder into 3 pieces across the screen. I’m really only showing this again because that sunset effect is gorgeous, though. 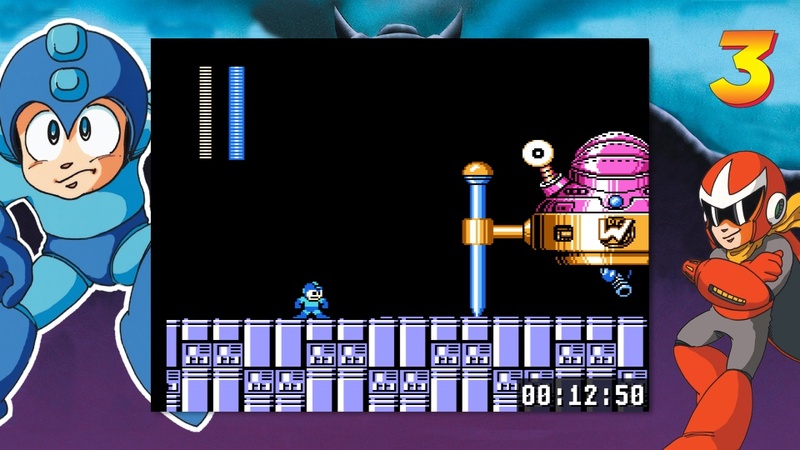 Otherwise, gameplay feels the same with the major exception of the rapid fire button, which has been slowed significantly across all 6 titles (or 12 counting the “Mega Man/Rockman” versions separately) from the approximately 30 fps speed that it was in the PC/console versions of Legacy Collection. On 3DS the rate of fire has been slowed to roughly the same level as the autofire in the PS1 Rockman Complete Works remakes or the Mega Man Anniversary Collection. This means the rapid fire is no longer useless in Mega Man 1, but no longer quite as useful as it was in Mega Man 2-6 (though still quite useful). I believe this change does make some of the uncanny Challenge mode times from the console versions impossible to perform on the 3DS, however. The biggest changes in my view are happening at the Museum! Museum mode has been expanded to include an “Antiques” category for each game. By my count, 216 new images have been added to the 3DS version’s museum (and 1 has been removed). The added images include all the Japanese, US, and a handful of European box scans and game cartridge labels, as well as scans of the Japanese manuals of all 6 games, along with more vintage advertisement pages or other promotional goodies. As a tradeoff of sorts, none of the 3DS museum pieces in general allow you to zoom in anywhere near as much or in as high a quality as you can on PC/console. A few Museum pieces have been relabeled or moved from the “Promo/Promotion” section to the “Antiques” Section. The previous mixup with Wily Machine 2’s first and second forms has been corrected, but the labeling of “Cut Blade” instead of “Rolling Cutter” has not (at least, not in English). The R2 “Smoke Man” and untitled “Ninja” robot master concepts are still MIA. Many references to Capcom’s Japanese address and telephone number have been censored out a la photoshop. Perhaps this information was long out of date. They also covered over the names and townships of the 48 boss contest winners who were originally listed in the Rockman 2 manual, and I’m not quite sure why. Their names still appear in the credits of the game, but perhaps they thought twice of giving that degree of personal information. The only museum piece that does not appear from the console is a Japanese ad for the Rockman 5 boss contest, probably because it contains Capcom’s old contact information which they were trying to hard to hide, and not much else to justify it being there. 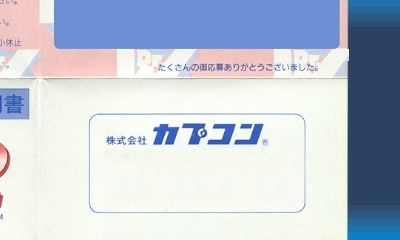 Example of name and address redaction from the Legacy Collection’s Rockman 2 manual. Compare to the original here. The 3DS version has only a single 1:1 resolution view, so no scanlines or widescreen (or my precious TV filter) options this time. It seems assuredly the most pixel crisp and accurate resolution the 3DS is capable of. It has different borders than the PC/console version, which can again be toggled on or off. The bottom screen is used for menus, which contain some limited touch screen interactivity. The lower screen also displays a streamlined version of the current game’s cover art as you play. The 3D effects of the 3DS are limited scrolling through menus, and the fact that the game screen, album cover, or museum image will pop out slightly in front of the borders during play. I’m a little disappointed with this, because ever since E3 2010 wet my appetite, I’ve been craving to play a true “3D Classics” version of the Mega Man titles. I probably would have been satisfied with something as simple as popping out the sprite and object layers in front of the background layer, but I’m going to let this missed opportunity slide, as the process of adding that sort of effect to the Eclipse Engine is probably more complicated than I’m capable of imagining. On the Steam version, the pin legs on the Wily Machine 3 are neatly covered by the golden joint in the foreground layer. On 3DS, the pins are visible in front of the joint. There are no leaderboards for challenges in the 3DS version, but you can save your favorite run of each challenge to the memory card. As before, there are no bonuses to be unlocked by completing every challenge or earning gold medal times. Unlike before, the timer now stops during the segment transitions instead of running continuously as it does on Steam. Because of this, performing a run the exact same way will net you a faster time on 3DS if the challenge contains more than one segment, and much faster if it contains many segments. Basically only the single boss time attack challenges are comparable. 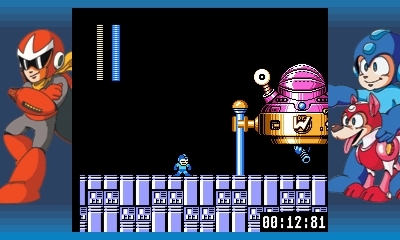 3DS version contains 11 new challenges, unlocked via scanning a Mega Man Amiibo (blue or gold). The Amiibo must be re-scanned every time the software is closed and reopened, much to the chagrin of those hoping to just borrow an Amiibo once to unlock the extra challenges on their save file. One was developed by gaming figure Colin Moriarty, while the other 10 new challenges were selected winners from a contest on Capcom-Unity, though it should be noted that the challenges themselves have been tweaked by the game developers, and so are different from what was submitted. A good example of these changes can be found here. 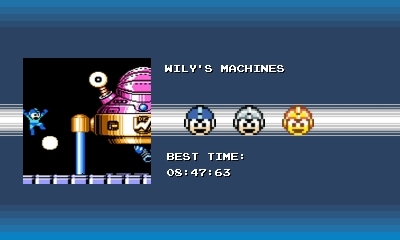 In my own experience, the most difficult of the Amiibo challenges by far is “Wily’s Machines”, which requires defeating all 6 Wily Machines using only the buster. One M-Tank can be used (in R5 only). You can check out the original contest submission here, which allowed for full E-tanks to be used and did not include the “Wily Capsule” forms for R5 and R6. Capcom really ramped up the challenge on that one. Right now my best time is 8:47:63, see if you can top that! My current record for the “Wily’s Machines” Amiibo Challenge. I doubt I’m going to be able to beat it, but maybe you can? Bottom line, I’m pleased with the additions made to the 3DS version, particularly the US/Japanese game inclusions, the Amiibo challenges, and the many many additions to the Museum. Even without going into the little bonus extras included with the physical releases and particularly the Collectors’ edition box (which I may write about another time), I think Mega Man Legacy Collection has a lot to offer. I do have a few of my own ideas (some that would have been easily implementable, others that are likely pure fantasy) about ways the product could have been improved, and I’ll probably write about that another time as well. 2 Comments to "The 3DS Difference"
Good write-up, thanks for that! The 3DS version is the one that I was the most interested in, so I’ve been holding off playing the others. Unfortunately, Amazon seems to have oversold the Collector’s Edition that I preordered back in December. More than one month later, I’m still waiting for it… and my fingers are getting twitchy. I’m very happy they’ve gone and added the Japanese versions! I haven’t had a chance to play the Amiibo challenges yet but wow, sounds super hard!